The conservative outlet wrote "Boom roasted" and tagged Daniels in the tweet. 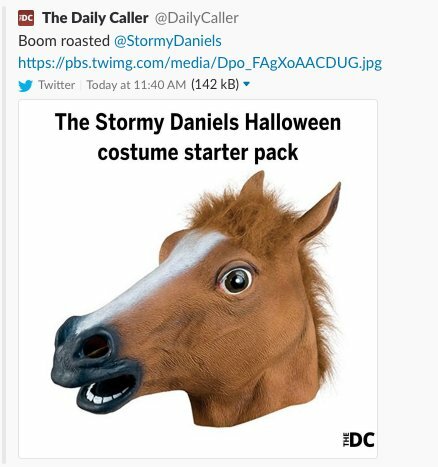 Keep it classy, Daily Caller. Shortly after posting a news story with the headline ‘Trump Drops Devastating Nickname on Stormy Daniels’ after the president called the adult film star “Horseface” while gloating about a federal judge tossing her defamation lawsuit, the conservative news site decided to go right down in the gutter. Someone at the outlet, meanwhile, must have come to their senses and realized just how bad taste the tweet was as it was deleted in short time. The reaction to the image, however, caused head-shaking and outrage nonetheless. When reached for comment on the deleted tweet, Editor-In-Chief Geoffrey Ingersoll had the following to say when asked who made the image and tweeted it out and who decided to delete it.